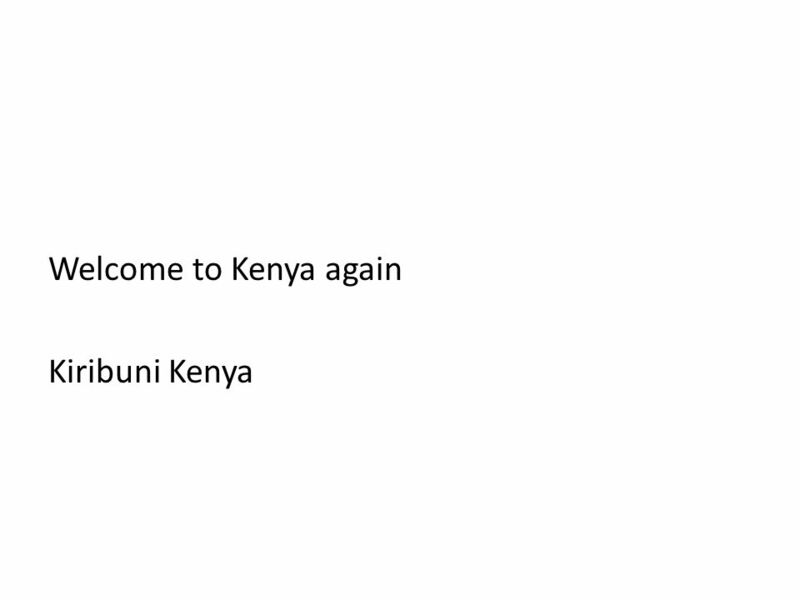 Welcome to Kenya. 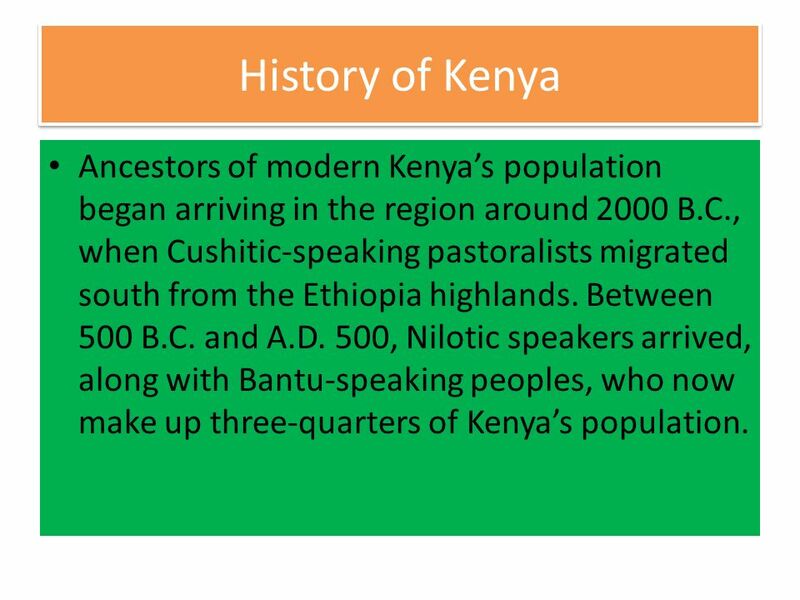 Ancestors of modern Kenyas population began arriving in the region around 2000 B.C., when Cushitic-speaking pastoralists migrated south. 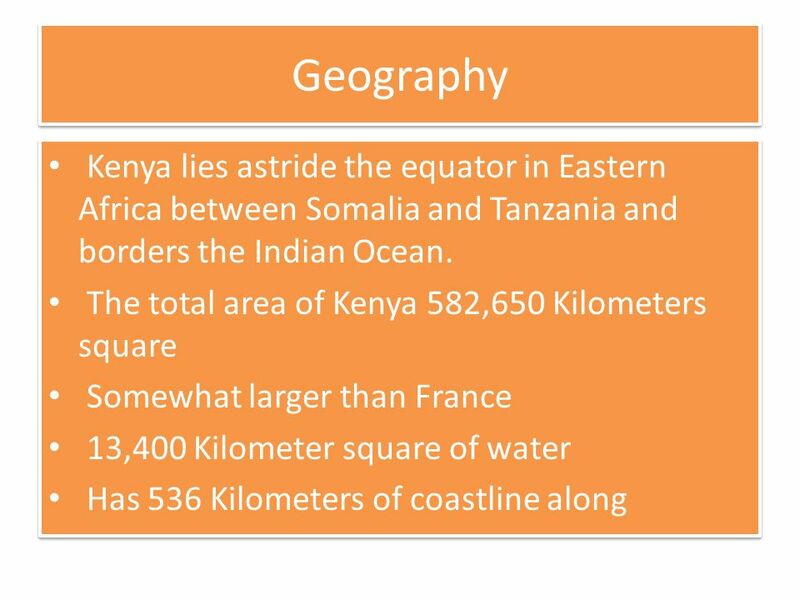 5 Kenya is an East African nation with a prominent coastal line along the Indian Ocean. 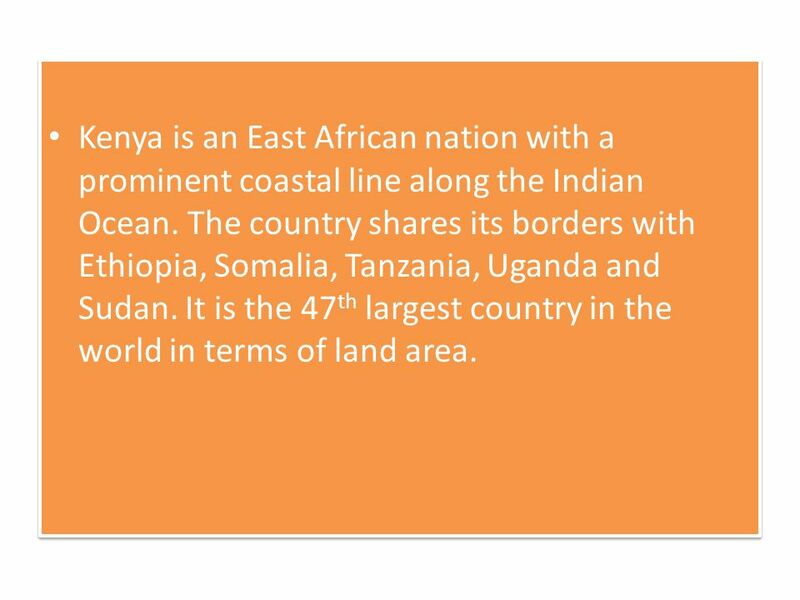 The country shares its borders with Ethiopia, Somalia, Tanzania, Uganda and Sudan. It is the 47 th largest country in the world in terms of land area. 6 Cont…. Kenya has two wet seasons and two dry seasons. 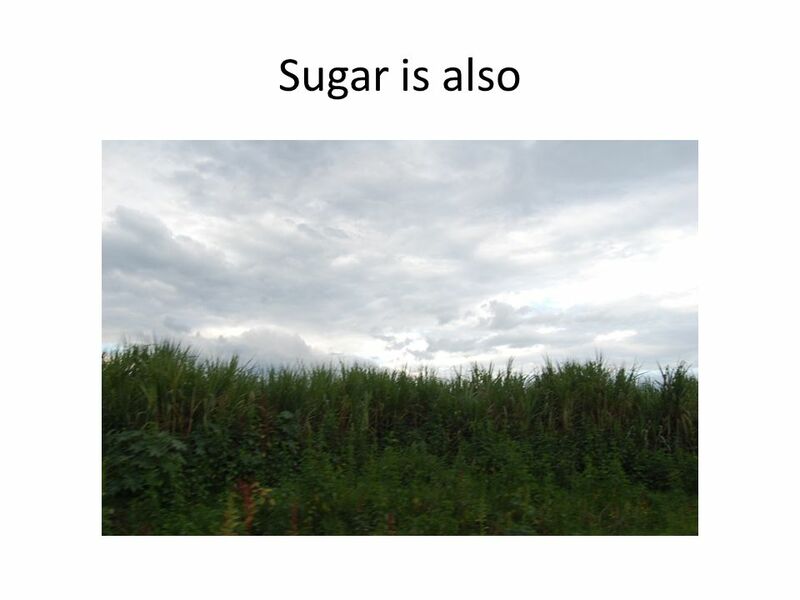 The rainy seasons extend from March to May and from November to January. The amount of rainfall is greatest in the highlands of Kenya, which are located in the west. The lowland deserts of the north receive the least amount of rain. Occasionally the rains fail or are below normal for consecutive seasons, leading to drought. 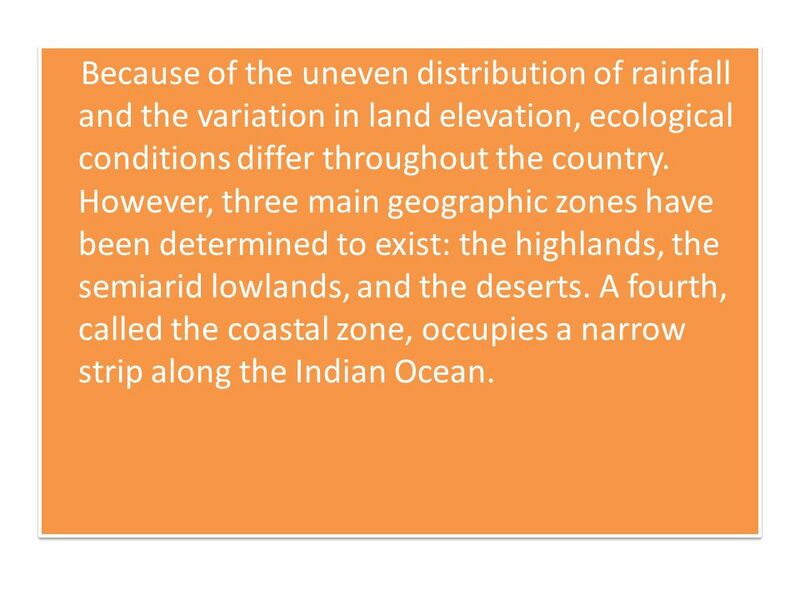 7 Because of the uneven distribution of rainfall and the variation in land elevation, ecological conditions differ throughout the country. However, three main geographic zones have been determined to exist: the highlands, the semiarid lowlands, and the deserts. A fourth, called the coastal zone, occupies a narrow strip along the Indian Ocean. 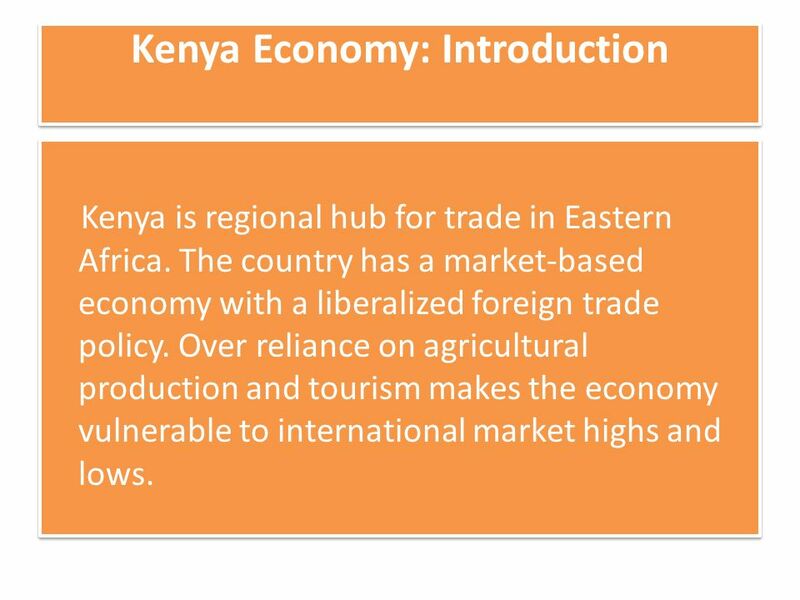 8 Kenya Economy: Introduction Kenya is regional hub for trade in Eastern Africa. 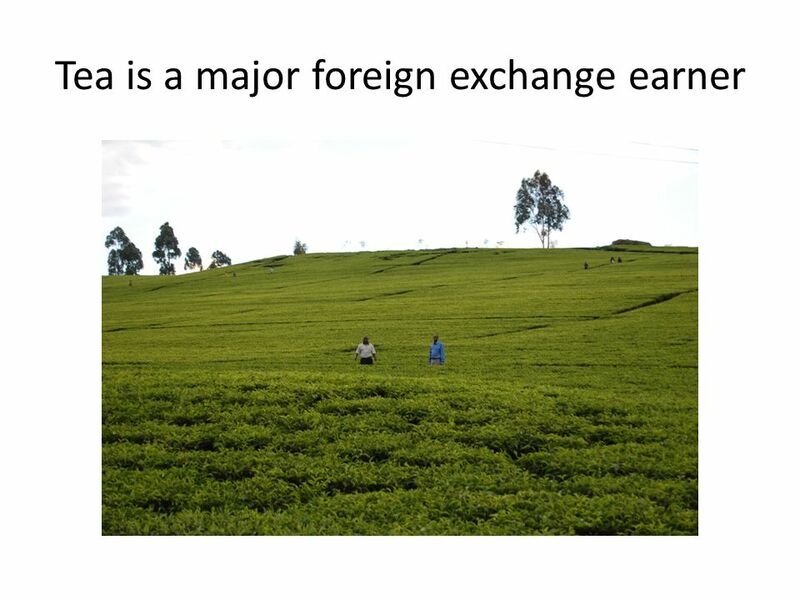 The country has a market-based economy with a liberalized foreign trade policy. 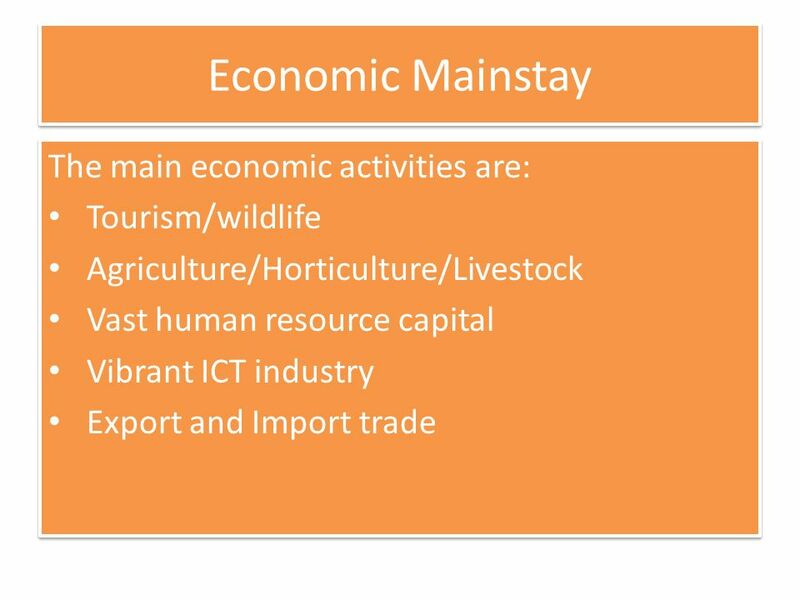 Over reliance on agricultural production and tourism makes the economy vulnerable to international market highs and lows. 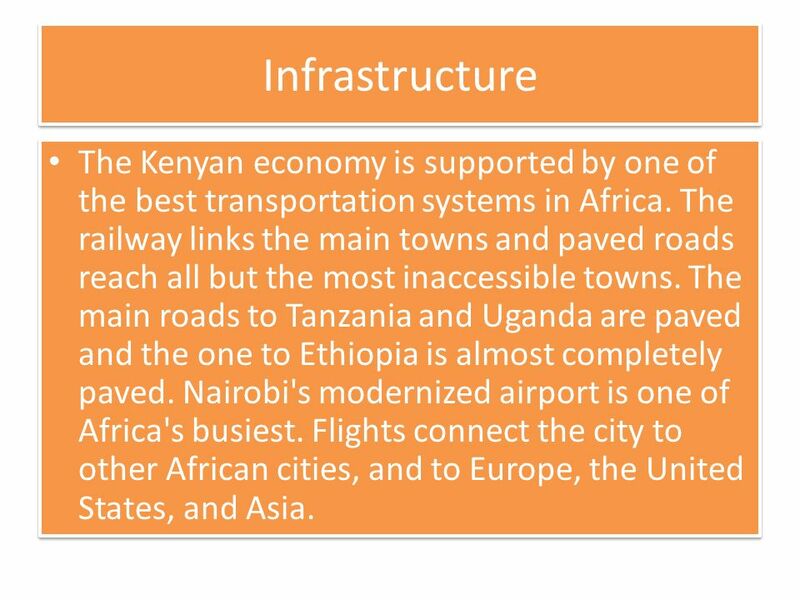 9 Infrastructure The Kenyan economy is supported by one of the best transportation systems in Africa. The railway links the main towns and paved roads reach all but the most inaccessible towns. The main roads to Tanzania and Uganda are paved and the one to Ethiopia is almost completely paved. Nairobi's modernized airport is one of Africa's busiest. Flights connect the city to other African cities, and to Europe, the United States, and Asia. 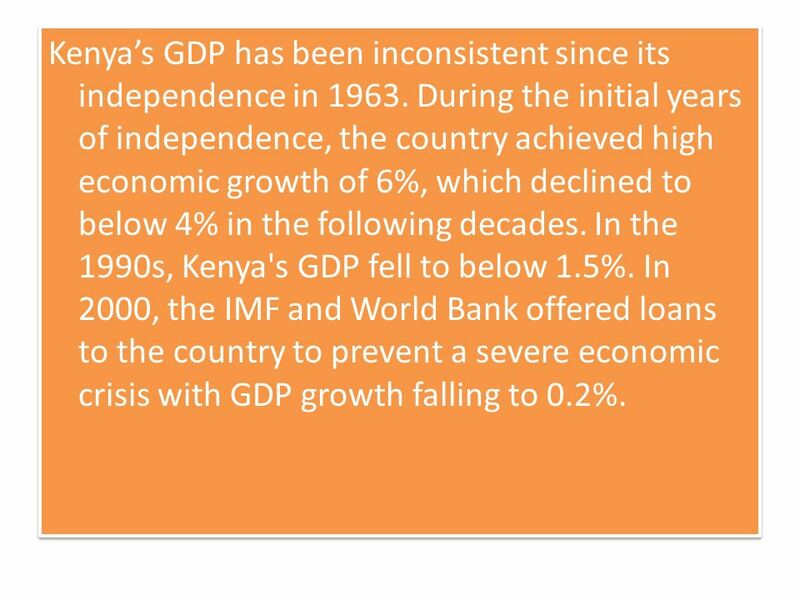 10 Kenyas GDP has been inconsistent since its independence in 1963. During the initial years of independence, the country achieved high economic growth of 6%, which declined to below 4% in the following decades. In the 1990s, Kenya's GDP fell to below 1.5%. In 2000, the IMF and World Bank offered loans to the country to prevent a severe economic crisis with GDP growth falling to 0.2%. 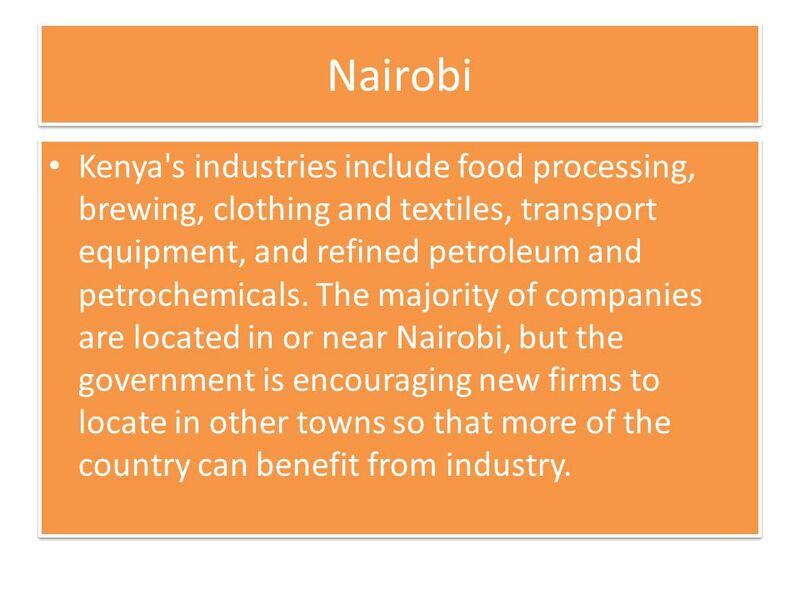 15 Nairobi Kenya's industries include food processing, brewing, clothing and textiles, transport equipment, and refined petroleum and petrochemicals. The majority of companies are located in or near Nairobi, but the government is encouraging new firms to locate in other towns so that more of the country can benefit from industry. 20 Historical overview When the Government of Kenya set up the Kenya National Library Service Board by an Act of Parliament in 1965, it was empowered to develop public library services in Kenya to fill the vacuum that existed before and soon after independence regarding the provision of public library services. 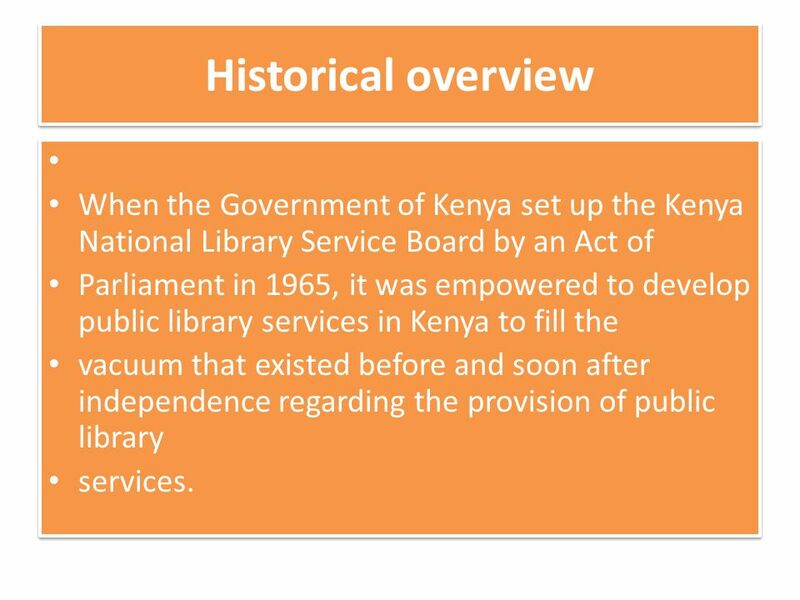 When the Government of Kenya set up the Kenya National Library Service Board by an Act of Parliament in 1965, it was empowered to develop public library services in Kenya to fill the vacuum that existed before and soon after independence regarding the provision of public library services. 21 Cont…. The first KNLS Board commenced its functions in 1967. The headquarters library in Nairobi opened its doors to the public in 1969. The library was first housed in a temporary building. The first KNLS Board commenced its functions in 1967. The headquarters library in Nairobi opened its doors to the public in 1969. The library was first housed in a temporary building. 22 Cont…. The initial book stock of 40,000 volumes of books was inherited from the former East African Literature bureau. 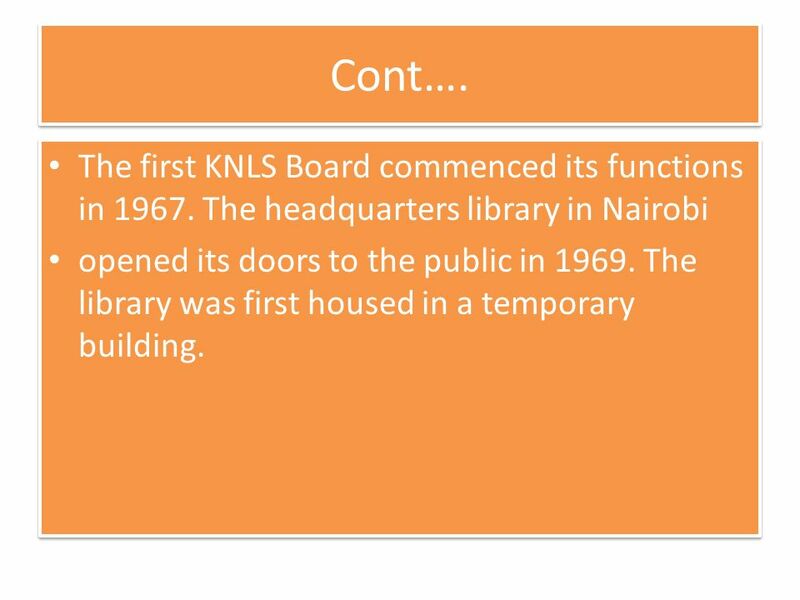 The current building housing the KNLS Headquarters and Nairobi provincial library was opened in 1974. 23 Cont…. 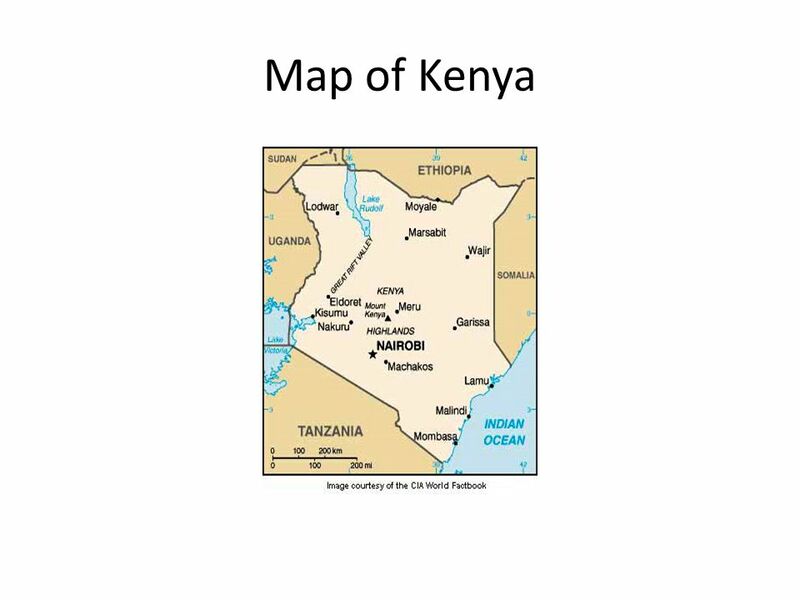 During its first ten years of existence, the Board, through funding from the Government of Kenya and donor agencies like the British Council, NORAD and UNESCO managed to put up a library in each of the eight provincial headquarters in Kenya. 24 Cont…. Nairobi, the capital city of Kenya, is located on the railway line at the junction between the lowlands and the highlands. More than 60 percent of Kenya's salaried workers live in the city, which dominates the nation's economy. 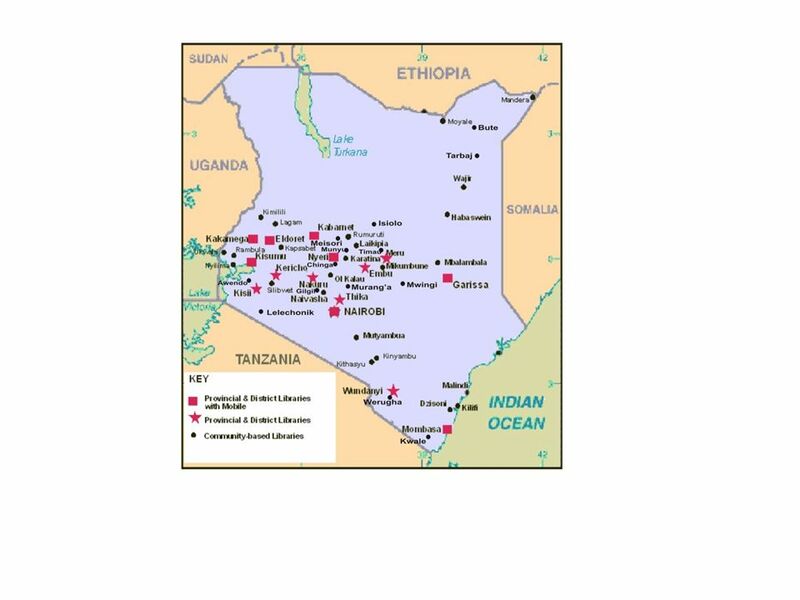 It is an important commercial center and many foreign firms base their east African operations there. 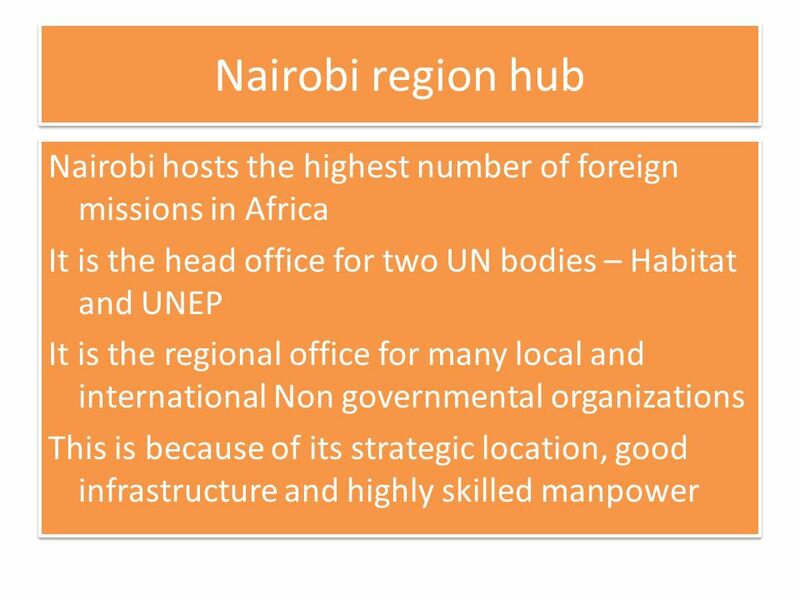 Most government employees also work in Nairobi. 25 Today Currently, the Board is responsible for managing 57 libraries spread throughout the country. They are categorized into Provincial, District, and Community Based libraries. 26 Community Based Libraries approach At its inception, the Board adopted a development strategy of putting up two libraries per year. Unfortunately, due to unfavorable economic conditions, the Government has continued to reduce its grants to most development projects. As a result, the Board has not been able to put up any other branch since 1987 when Kabarnet District library was opened to the public. 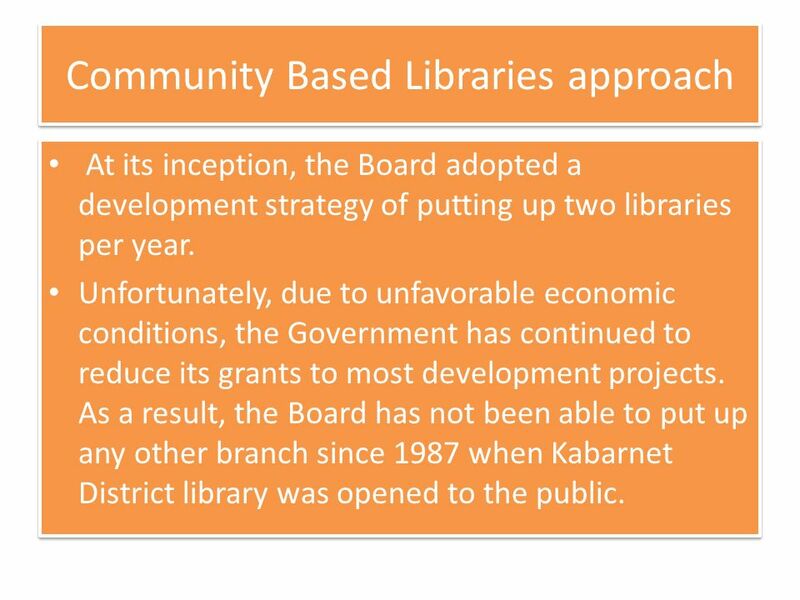 At its inception, the Board adopted a development strategy of putting up two libraries per year. Unfortunately, due to unfavorable economic conditions, the Government has continued to reduce its grants to most development projects. As a result, the Board has not been able to put up any other branch since 1987 when Kabarnet District library was opened to the public. 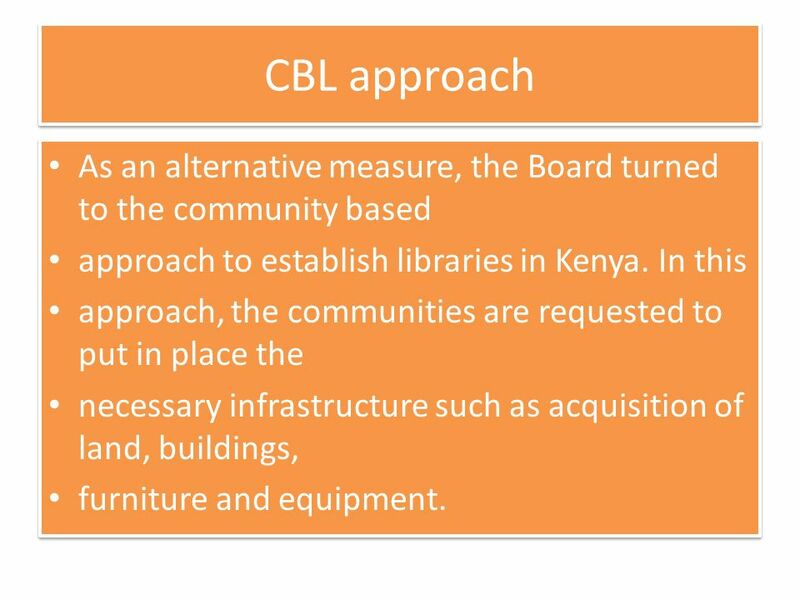 27 CBL approach As an alternative measure, the Board turned to the community based approach to establish libraries in Kenya. 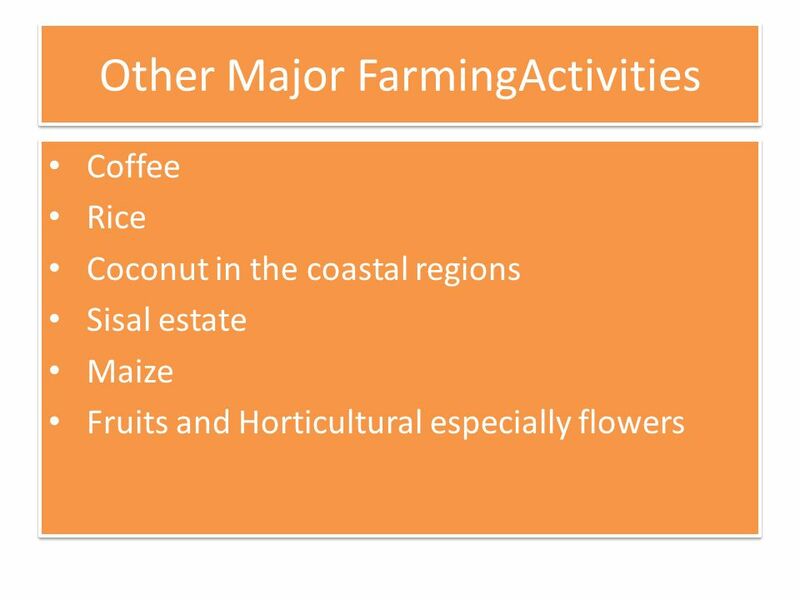 In this approach, the communities are requested to put in place the necessary infrastructure such as acquisition of land, buildings, furniture and equipment. 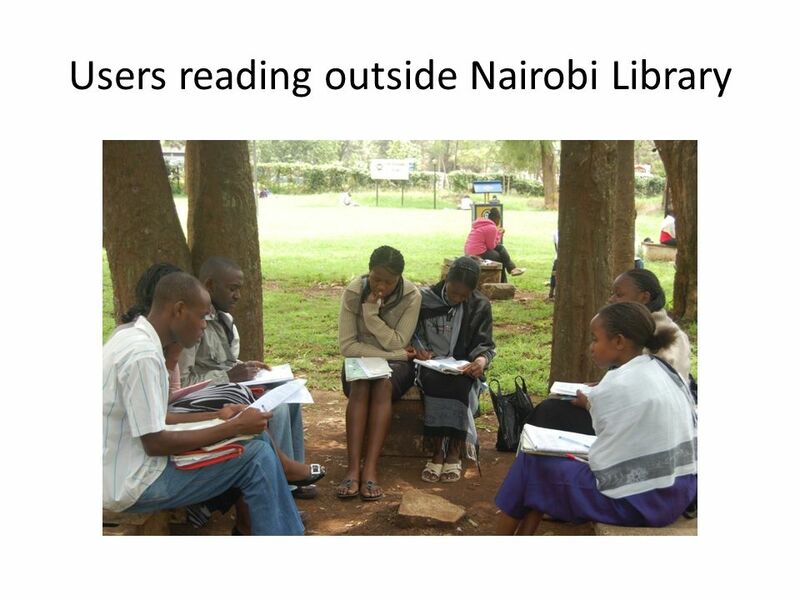 As an alternative measure, the Board turned to the community based approach to establish libraries in Kenya. In this approach, the communities are requested to put in place the necessary infrastructure such as acquisition of land, buildings, furniture and equipment. 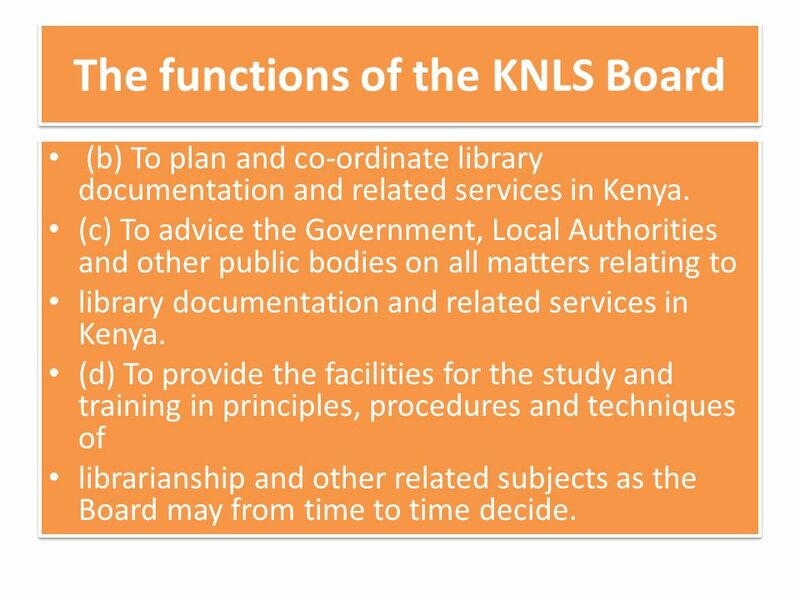 28 The functions of the KNLS Board (b) To plan and co-ordinate library documentation and related services in Kenya. (c) To advice the Government, Local Authorities and other public bodies on all matters relating to library documentation and related services in Kenya. (d) To provide the facilities for the study and training in principles, procedures and techniques of librarianship and other related subjects as the Board may from time to time decide. (b) To plan and co-ordinate library documentation and related services in Kenya. (c) To advice the Government, Local Authorities and other public bodies on all matters relating to library documentation and related services in Kenya. (d) To provide the facilities for the study and training in principles, procedures and techniques of librarianship and other related subjects as the Board may from time to time decide. 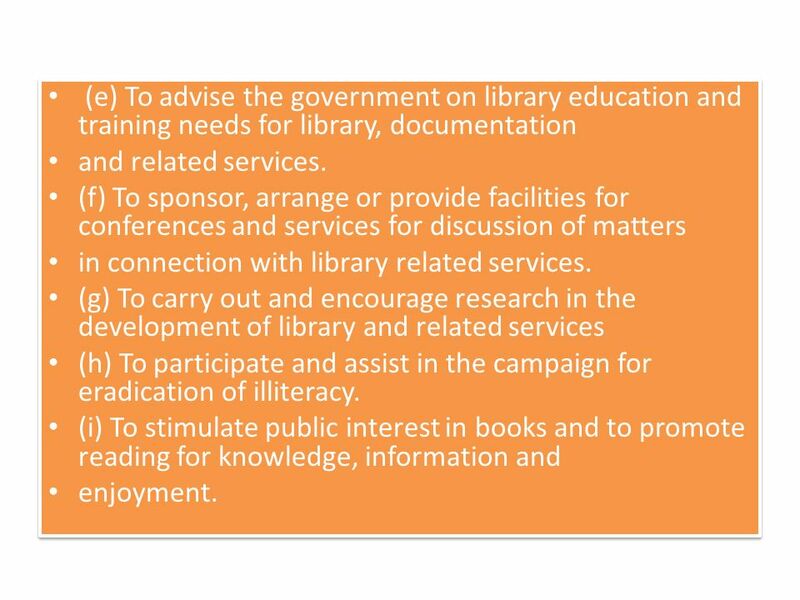 29 (e) To advise the government on library education and training needs for library, documentation and related services. (f) To sponsor, arrange or provide facilities for conferences and services for discussion of matters in connection with library related services. (g) To carry out and encourage research in the development of library and related services (h) To participate and assist in the campaign for eradication of illiteracy. (i) To stimulate public interest in books and to promote reading for knowledge, information and enjoyment. (e) To advise the government on library education and training needs for library, documentation and related services. (f) To sponsor, arrange or provide facilities for conferences and services for discussion of matters in connection with library related services. (g) To carry out and encourage research in the development of library and related services (h) To participate and assist in the campaign for eradication of illiteracy. (i) To stimulate public interest in books and to promote reading for knowledge, information and enjoyment. 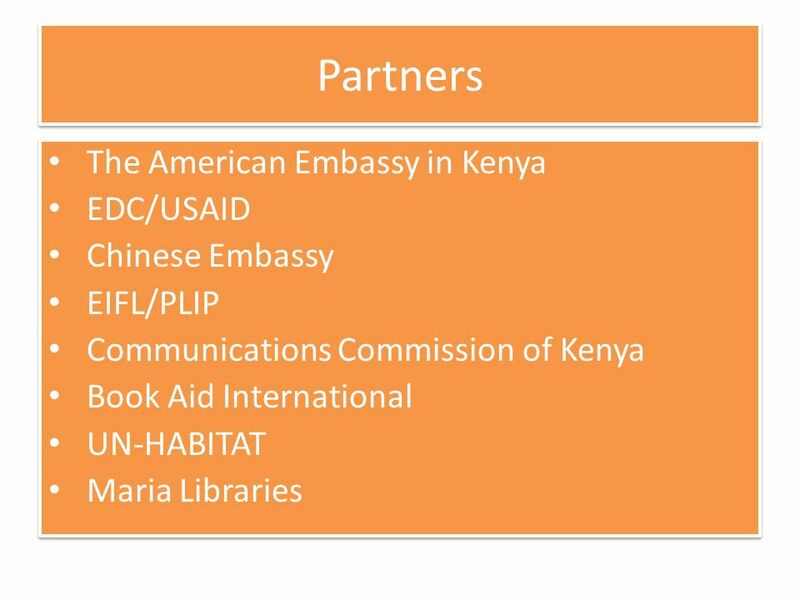 30 (j) To acquire books produced in and outside Kenya and such other materials and services of knowledge necessary for a comprehensive library. (k) To publish the National Bibliography of Kenya and to provide bibliographic and reference services. (j) To acquire books produced in and outside Kenya and such other materials and services of knowledge necessary for a comprehensive library. 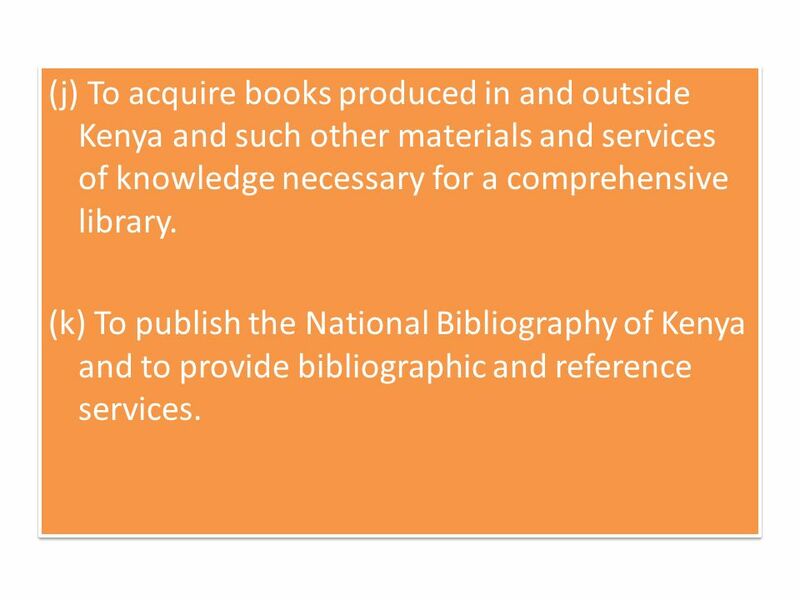 (k) To publish the National Bibliography of Kenya and to provide bibliographic and reference services. 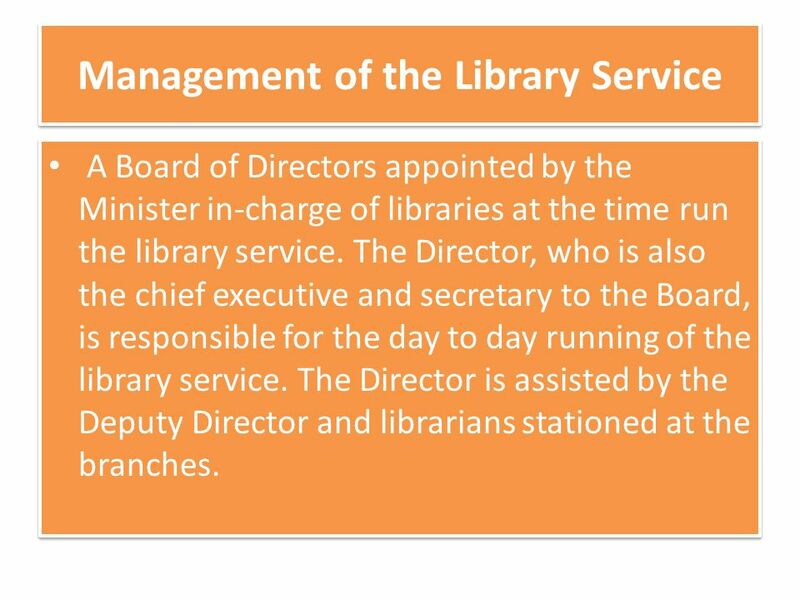 31 Management of the Library Service A Board of Directors appointed by the Minister in-charge of libraries at the time run the library service. The Director, who is also the chief executive and secretary to the Board, is responsible for the day to day running of the library service. The Director is assisted by the Deputy Director and librarians stationed at the branches. 32 Book stock and readership KNLS as a public library strives to provide free and unlimited access to information by providing a variety of services. 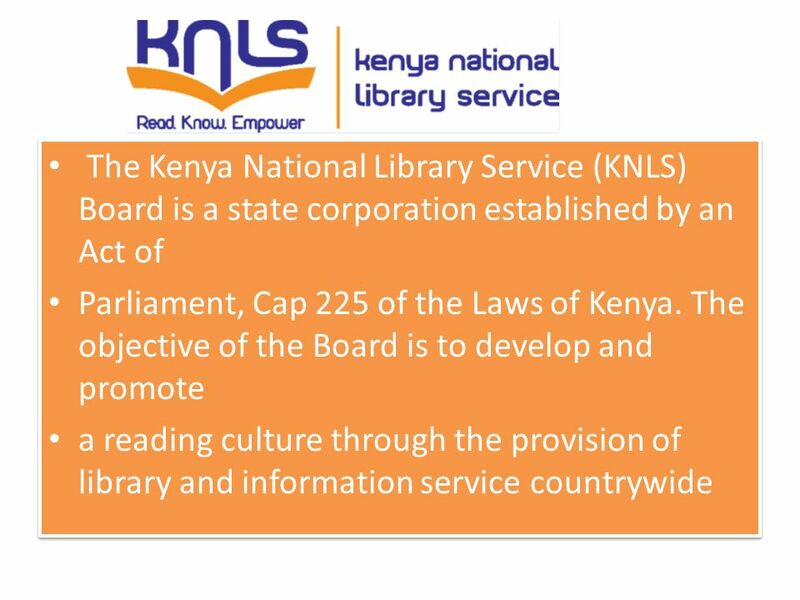 KNLS goes by the motto Reading is knowledge which illustrates that the library service is intended chiefly to aid education besides providing an opportunity for Kenyans to spend their leisure time in purposeful and meaningful recreation. KNLS as a public library strives to provide free and unlimited access to information by providing a variety of services. KNLS goes by the motto Reading is knowledge which illustrates that the library service is intended chiefly to aid education besides providing an opportunity for Kenyans to spend their leisure time in purposeful and meaningful recreation. 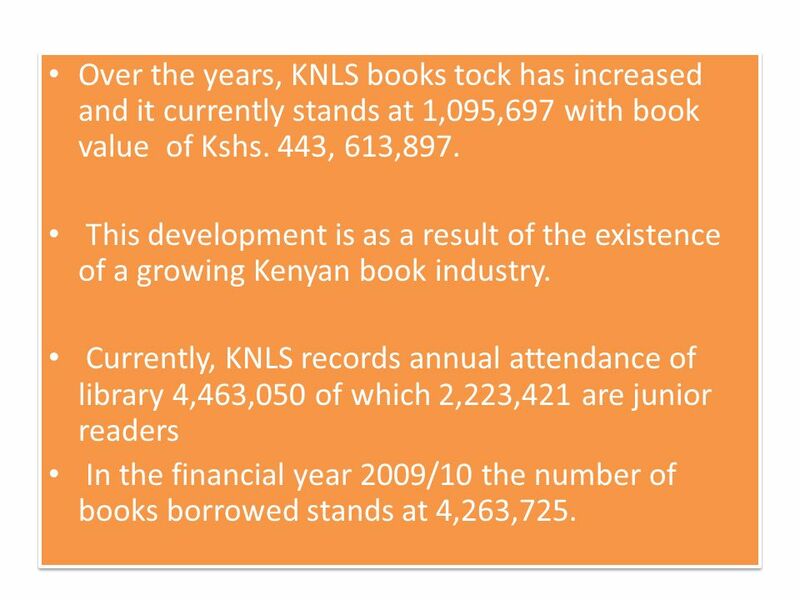 33 Over the years, KNLS books tock has increased and it currently stands at 1,095,697 with book value of Kshs. 443, 613,897. This development is as a result of the existence of a growing Kenyan book industry. 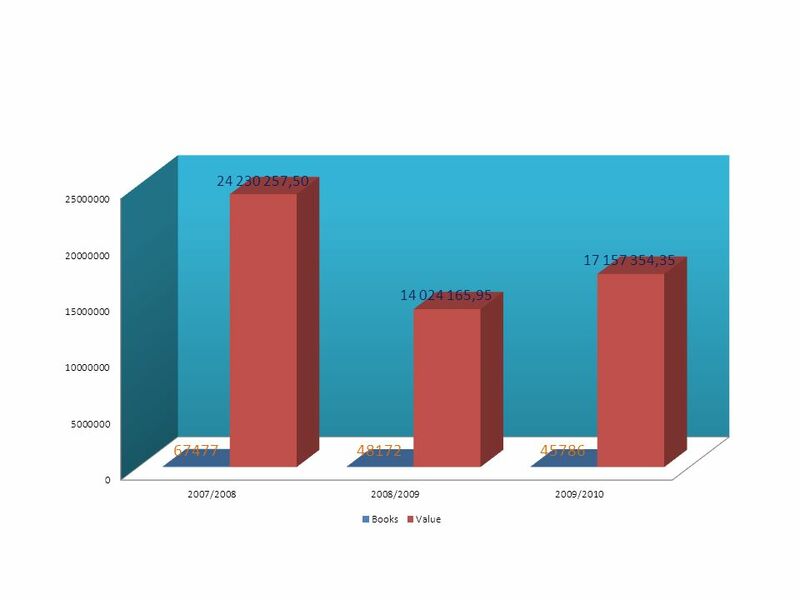 Currently, KNLS records annual attendance of library 4,463,050 of which 2,223,421 are junior readers In the financial year 2009/10 the number of books borrowed stands at 4,263,725. 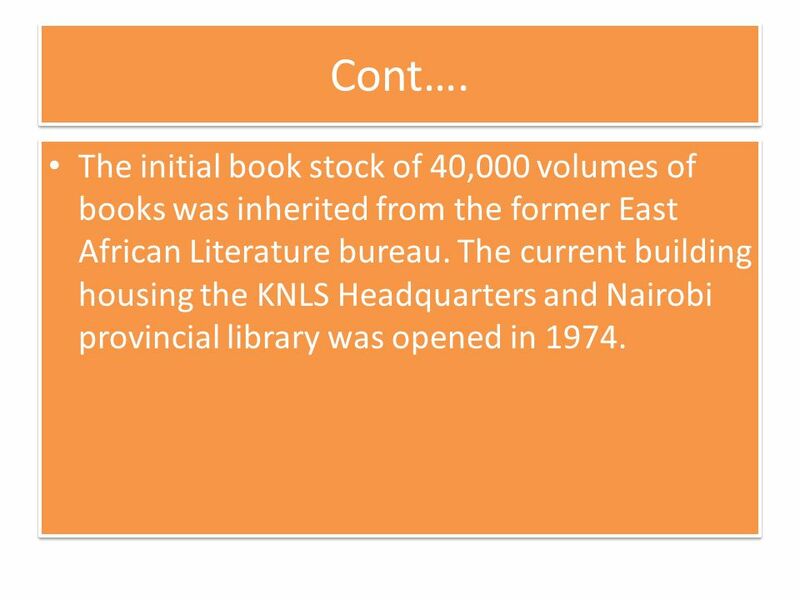 Over the years, KNLS books tock has increased and it currently stands at 1,095,697 with book value of Kshs. 443, 613,897. This development is as a result of the existence of a growing Kenyan book industry. Currently, KNLS records annual attendance of library 4,463,050 of which 2,223,421 are junior readers In the financial year 2009/10 the number of books borrowed stands at 4,263,725. 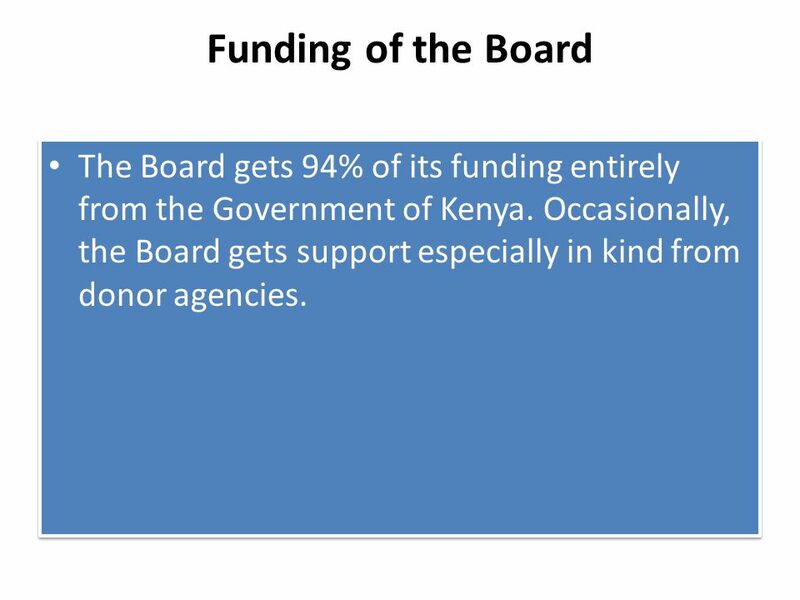 36 Funding of the Board The Board gets 94% of its funding entirely from the Government of Kenya. Occasionally, the Board gets support especially in kind from donor agencies. 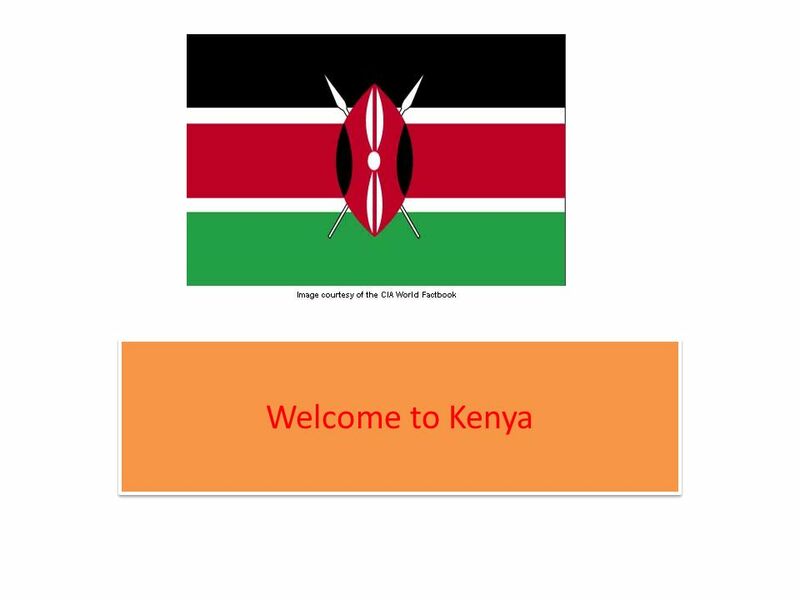 Download ppt "Welcome to Kenya. Ancestors of modern Kenyas population began arriving in the region around 2000 B.C., when Cushitic-speaking pastoralists migrated south." GHANA PAKISTAN PARTNERSHIP. HEADLINES EDUCATIONAL CENTRE KUMASI-GHANA PRESENTS. Striving for the Development of Motorcycle Sports in Asia Presented by Shi Tianshu Chairman of the CMSA Board of Directors Candidate for UAM President. Welcome and Introduction Councillor Will Mumford Portfolio Holder for Economic Regeneration & Strategic Planning Devon County Council. International Congress and Convention Association “SECB Singapore Inc. Approach” ALOYSIUS ARLANDO Acting Assistant Chief Executive Singapore Exhibition. BUSINESS OPPORTUNITIES IN SRI LANKA 5 April 2012. Economic Growth in Developing Nations. Characteristics of Developing Nations. From a Great Past to a Greater Future 1 Economic Outlook & Opportunity: Presentation By: Julius K. Korir Ag. Managing Director Kenya Investment Authority. 1 CHAPTER 12 INTERNATIONAL FINANCING AND NATIONAL CAPITAL MARKETS. INTRODUCING TAKAFUL IN NON - TAKAFUL MARKETS: THE CIC KENYA EXPERIENCE Presenter: Steve Muia Business Development Manager The Co-operative Insurance Company. CULTURAL INDUSTRIES IN JORDAN By Riad al Khouri, BLitt (Oxon) Director, MEBA wll May 2004. Where Are More and Less Developed Countries Distributed? LOCAL SELF- GOVERNMENT IN SLOVENIA. Legal context Slovenia is a "territorially unified and indivisible State“ (art. 4 of the Constitution). It has a bicameral.